NEW DELHI: The Supreme Court was informed Monday that the body of a person, among the 15 miners trapped for over a month inside a flooded illegal coal mine in Meghalaya, has been retrieved while another body has been spotted by the Indian Navy. A bench of Justices A K Sikri and S Abdul Nazeer was told by the lawyer appearing for the petitioner who has filed a public interest litigation (PIL) seeking urgent steps for rescuing the miners trapped in the rat-hole mine since December 13 last year, that its de-watering was necessary to retrieve the bodies. The Centre told the apex court that a body was recovered on January 24 during the rescue operation and on January 26, the Navy personnel spotted the second body at about 280 feet. "Search for balance survivors/mortal remains is in progress," the Centre said in its report detailing the status of action taken by the authorities. Senior advocate Anand Grover, appearing for petitioner Aditya N Prasad, said that 14 to 15 high-powered water pumps were required to de-water the mines. "Without de-watering the mines, they (authorities) cannot have access to the bodies," he said, adding that equipments of the Indian Army were needed in the rescue operation. Solicitor General Tushar Mehta, appearing for the Centre, told the bench that Army personnel were already involved in rescue operation along with officials of the National Disaster Response Force (NDRF), Indian Navy and other agencies. He said the suggestions given by Grover on the ongoing rescue operation would be duly considered by the authorities. The bench has posted the matter for further hearing on February 4. 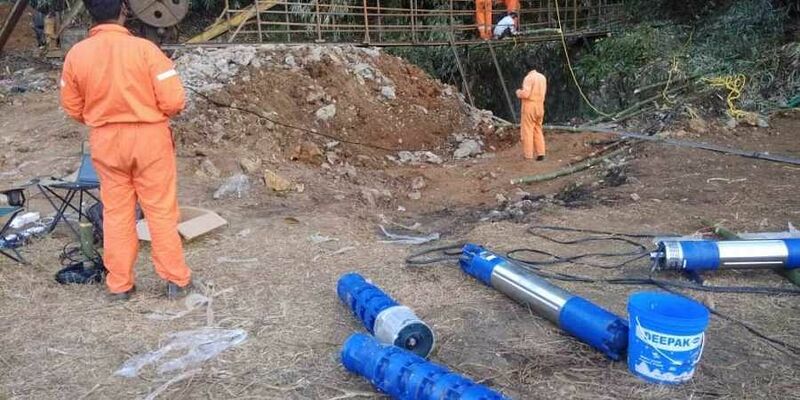 The illegal mine is located at Ksan in Meghalaya's East Jaintia Hills district, about 3.7 km deep inside a forest and can be accessed after crossing three streams. It was flooded when water from the nearby Letein river gushed into it. Rat-hole mining involves digging of narrow tunnels, usually three-four feet high, for workers to enter and extract coal. The horizontal tunnels are often termed "rat holes" as each just about fits one person. In its status report filed in the top court, the Centre said that crores of litres of water has been pumped out from the mine and remotely operated vehicles (ROVs) of the Indian Navy were already working in the rescue operation. "Underground ROVs being operated in adjacent mines, systematically searching and sanitising them one by one. So far, two adjacent mines have been searched and declared clear," the report said. It said Indian Air Force aircraft were also deployed for rescue operation. Last week, the state government had told the top court that on January 16, the ROV of Indian Navy had detected a body at a depth of 210 feet in the flooded mine and efforts were being made to retrieve it but could not be completed as the body parts started disintegrating. On January 11, the Centre had told the court that it has to "believe in miracles" for the 15 miners to come out alive. The apex court had earlier expressed dissatisfaction over the steps taken by Meghalaya government to rescue these miners and had said "prompt, immediate and effective" operation was needed to rescue them as it was a matter of life and death.